Do you like ice cream? Then head on over to Sara's Cooking Class today for a lesson on making your very own ice cream puffs. This light and fluffy dessert is a delicious snack and great way to end any meal. Practice preparing this yummy treat in Sara's Cooking Class so that you can serve them to your family and friends at the next dinner party or potluck you attend. 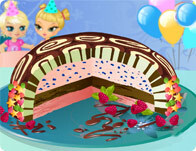 Follow the instructions and stick to the recipe to concoct this fabulous dessert in this fun online cooking game for kids. Your progress is timed, so work quickly to complete this dish and earn a high score! First prepare delicious golden pastries, then use them to sandwich tangy strawberry ice cream. Now there is just one final step to finish this scrumptious dessert'pour on as much chocolate sauce as you like and then sink your teeth in to enjoy your hard work!